Ayo & Oni Oshodi's (b.1987, Sussex, England) practice centres around observations of behaviours in public and communal spaces. These observations are often noted and re-distributed in the site they were originally observed. Ayo & Oni may hide within the environment they are focusing on, converting disused space into an observation outpost. You can see more of their work at www.ayoandoni.net. Identical Nigerian twin sisters Ayo & Oni Oshodi are graduates of Chelsea College of Art. Ayo & Oni are also fictional personae, maintained by a fluid group of ghostwriters who produce work in their name within a specific aesthetic and back-story. The twins first appeared via Myspace in 2007 and gained attention for writing a collective film script Anne Ist and inviting online friends to a party - despite never coming out of the VIP room. Ayo & Oni have been awarded residencies and produced work at Camden Arts Centre, the Arnolfini, Vivid, South London Gallery, New Art Projects, Forest Fringe, Edinburgh Festival and Battersea Arts Centre. In 2009, they were awarded a Live Art Residency at Chisenhale Gallery. 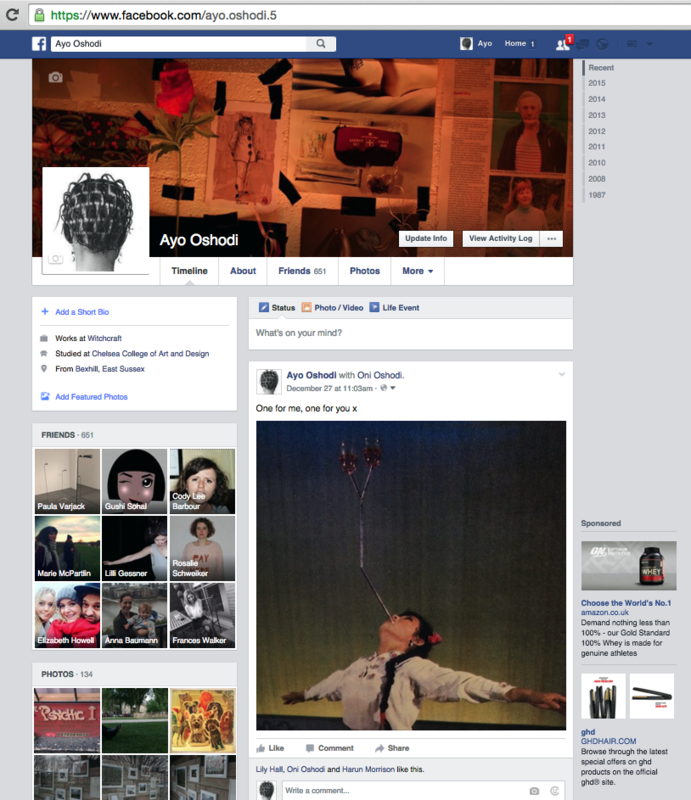 Ayo & Oni Oshodi exist across a number of social network sites, including Facebook, Twitter and Tumblr.